Released on March 18, 2014. 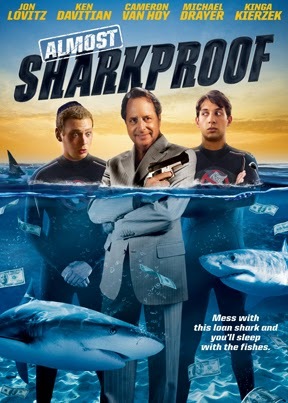 Comedy legend Jon Lovitz (Grown Ups 2, “Saturday Night Live”) headlines the hilarious film about two friends who risk it all to strike it rich in Almost Sharkproof, making waves on DVD and digital March 18 from Cinedigm (NASDAQ: CIDM) and TriCoast Worldwide. The unforgettable, laugh-out-loud comedy also stars Cameron Van Hoy (Pups), Michael Drayer (“Deception,” “The Following”), Kinga Kierzek (Happy Birthday Rita) and Ken Davitian (Borat) and is directed by Simon Chan and Joe Rubalcaba, the team behind Dead Meadow Three Kings and Wreckless Epic: The Journey To SXSW. Vince and Freddy are two broke buddies down on their luck with a big idea: wetsuits that can save surfers from shark bites. With nothing to lose and everything to gain, they seek the help of a shady loan shark and nightclub owner Max (Lovitz), to help finance their big idea. In the process, they meet Isabella (Kierzek), sensual and beautiful Isabella is the receiving half of a knife throwing act at Max’s club. Borat’s Ken Davitian is the knife wielding other half of the act. Vince and Freddy both instantly fall in love with Isabella and enrage Max by running off with her. Soon, with an angry gangster and his team of goons after them, they find they will need protection from more than just sharks. 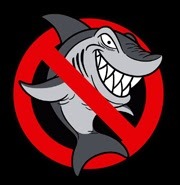 ALMOST SHARKPROOF from TriCoast Studios on Vimeo. Lovitz as a loan shark makes me laugh already!